The two-up touring sled may be enjoying a bit of a revival. 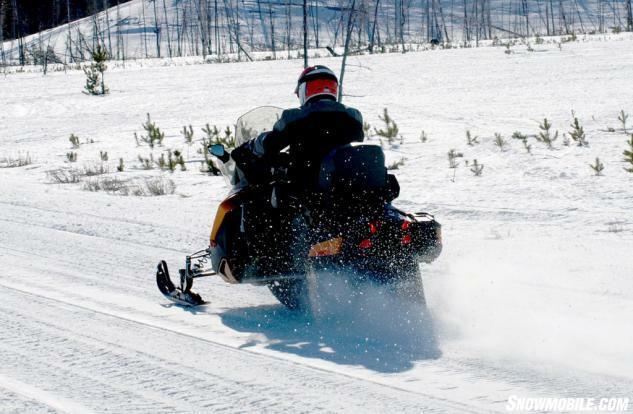 While never the top-selling niche in the snowmobile marketplace, two-up touring models serve a need, especially with long-distance riders. Some of the two-up popularity faded a bit with the emergence of what we call personal luxury sport sleds like the new Ski-Doo Enduro or Polaris’ Adventure, both a virtual Swiss army knife of versatility. 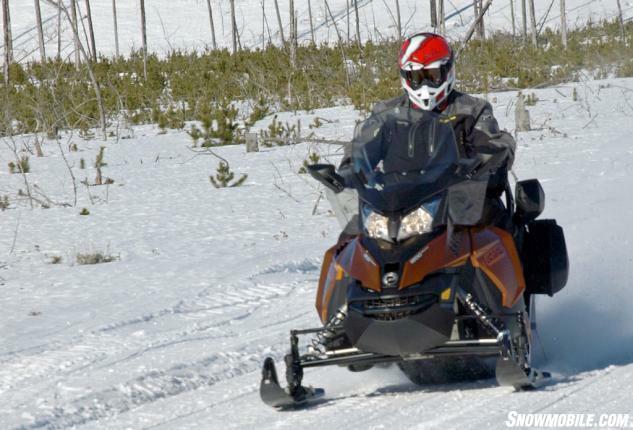 Still, the top of the line, technology-laden two-up touring snowmobile serves the serious snowmobiler who demands on-trail comfort, above average performance, and all the bells and whistles known to modern snowmobiling. No company understands this buyer better than Ski-Doo, whose factory doors open onto the world-renowned Quebec snowmobile trail system with its freeway-wide snow lanes groomed relentlessly by some of the best groomer drivers in the snow world. 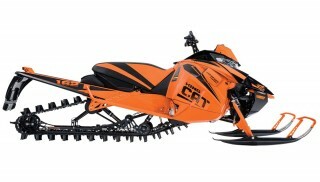 When you look to build a top line touring sled, you look at what Ski-Doo offers and then try to better it. 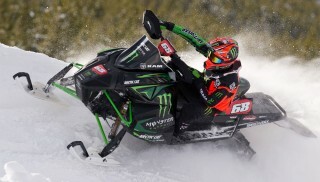 Arctic Cat’s all-new Pantera is a worthy competitor. Yamaha’s top Venture models offer similar performance to Ski-Doo’s 1200 4-TEC, but Ski-Doo still leads the way when it comes to best in class. 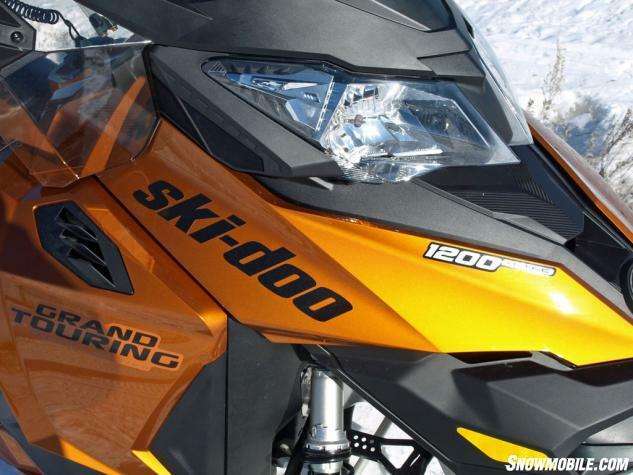 For 2016, the best in class two-up touring sled has to be Ski-Doo’s rejuvenated Grand Touring SE 1200 4-TEC. We say rejuvenated because the big touring sled moves to the somewhat narrower REV-XS platform, which makes it a trimmer version than before. Plus, updating the 4-TEC triple to the Intelligent Throttle Control (ITC) gives this sled an entirely new on-trail persona. These two changes provide a perceptible good feeling about this model. Although designed as the top of the line two-up touring sled, the new Grand Touring SE 1200 4-TEC could be a serious choice for long distance solo rides. At our springtime test riding session, it was obvious that Ski-Doo views the upgrade to the 4-TEC as a big deal. How else do you explain the proliferation of test sleds with that drivetrain and a dearth of 600 ACE models available for test rides? We rode 1200 4-TEC powered stretch track models, short track sport models, adventure sport models and the Grand Touring SE. Admittedly we have been under impressed with Ski-Doo’s triple performance mode electronics in the ACE engines and we still don’t see a real need for the ECO mode outside of Yellowstone Park. But we’ll accept the 1200 4-TEC’s real-world performance settings of Standard and Sport. Yes, we prefer the smoother more linear feel of the standard setting, especially on this touring enhanced model. We can accept the Sport setting with its quicker ramp up and almost two-stroke-like aggressive giddy-up. If you are knowingly needing to get maximum fuel economy approaching 20 miles per gallon on your sojourn, then by all means select the ECO mode, enjoy a hot coffee and text away as you amble down the trailways. We will give Ski-Doo credit for the upgrades to the 4-TEC. 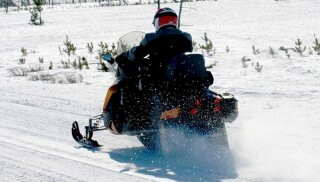 It proved very smooth and rider-friendly, regardless of the sled model it was powering. We liked it. Flat out, we enjoyed the easy throttle pull, which seemed to relay much improved and quicker thumb to drivetrain response. This is a major upgrade for serious distance riders. Throttle fatigue should be nil on even the longest rides. Of course, if you find the throttle pull tiresome on your thumb, you can flip the lever around the handlebar to get a finger throttle. We aren’t sold on that. We understand it and so far we have yet to hear of any newbie riders going into a panic, grabbing the finger pull and causing a crash. It just seems too easy for a rider to freeze at the controls and pull the finger throttle to wide open. Guess maybe we’re old and worry too much. Ski-Doo seems to think it works just fine and we have to believe that the company’s product liability lawyers signed off on it. So, it must be just fine. Styled in bright cognac, the new for 2016 Grand Touring SE features a narrowed exhaust side panel and designed in wind deflectors to work with a 24-inch tall windshield. The engine is also just fine. 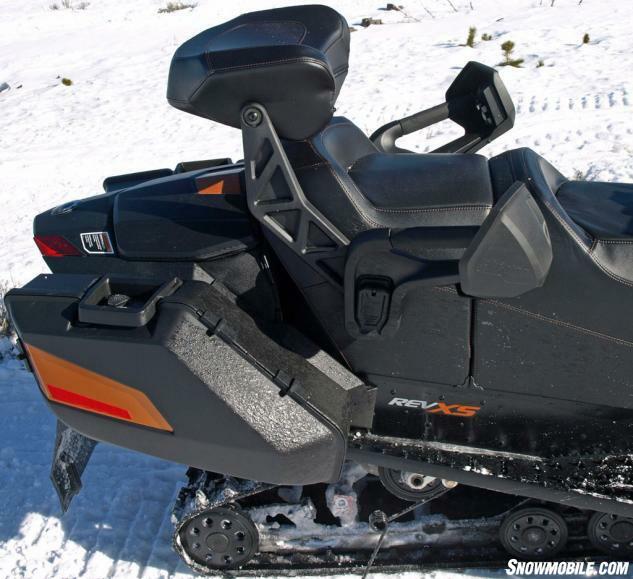 Well, better than just fine as it enjoys an upgraded exhaust, which offers what we felt to be stronger midrange and smooth drive-off performance – both strong must haves for a touring sled. You’ll hear a more positive and emphatic exhaust note as exhaust tuning included downsizing to a more compact exhaust canister. This allowed the move from the REV-XR platform to the REV-XS chassis, which stretches 127 inches from ski tip to snow flap and measures 47.9 inches from outside ski edge to outside ski edge. Since the 2016 SE measures the same as the previous SE at those dimensions, the main REV-XR difference was a wider cowl to accommodate the width of the 1200 4-TEC and its larger exhaust package. According to Ski-Doo, the XR, which first appeared in 2009, offered a so-called refined and muscular styling presence and afforded better wind protection for luxury sled riders. The switch to the XS reflects the exhaust canister change and other means to deflect wind and cold. Obviously one way to discourage wind is the use of a 24-inch windshield height, complete with side deflectors. While that is all well and good for the rider’s comfort against wind and cold, Ski-Doo puts technology to work for added on-trail ride comfort. 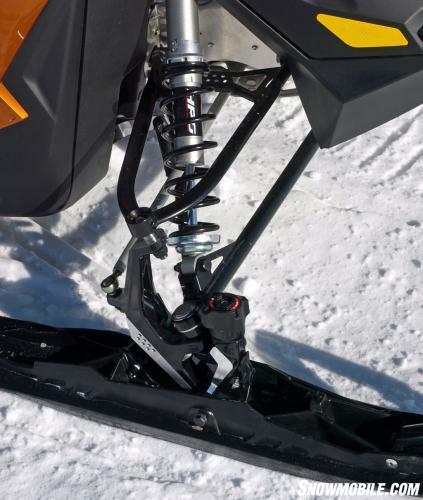 Up front the SE enjoys the best of Ski-Doo suspension design with the latest RAS2, which is fitted with coil-over HPG shocks and the new-for-2016 Pilot TS adjustable blade ski. Front travel maxes out at nine inches. You expect the latest technologies in a state of the art touring sled and the SE delivers with the RAS2 front suspension and new-for-2016 tunable Pilot TS skis. The SE’s rMotion rear suspension has its own tricks with an air spring on the rear arm working in conjunction with the center arm’s HPG shock. Maximum travel is 13 inches. What makes this set up special is the on-the-fly adjustability of the air spring, which is controlled by a handlebar-mounted rocker switch. We found ourselves really getting into the Air Ride aspect of this sled. While the softest setting was too soft for us, we liked the mid ratios best. The top setting seemed too stiff for long haul comfort, but if you are carrying a heavy load, it’ll work well. Tied into the luxury appointments of the “tricked-out” rMotion suspension is the use of a SilentDrive track and driver system that reduces overall track noise by a claimed 65 percent at cruising speeds. That five decibel reduction is a big deal as is the fact that Ski-Doo engineers managed to tune the SilentDrive so as to cut vibration at your feet by as much as 70 percent! While your feet feel less vibration, your fanny will feel the heat. The SE features plush and heated seating for two riders. The seat heater has two levels to assure maximum comfort even on serious winter rides. The adjustable backrest blends into the SE’s living room, which features two levels of heat for the seat, heated grips and ample foot room. The air-shock cushioned comfort ride melds with the SE’s SilentDrive, which reduces vibration at the feet by up to 70 percent and drops track noises by 65 percent. To accommodate long haul travel, the SE is fitted with injection-molded, lockable but removable hard plastic side cases as well as a tunnel bag. The cases come with carry handles and elastic v-straps on the inside. As you’d expect on a luxury touring sled, the SE features standard electric start, push button reverse, driver and passenger heated grips, Ski-Doo’s multi-function gauge, the comfort and control of a curved aluminum handlebar, 12-volt accessory outlets, and rearview mirrors. Wide open miles or forest lined trails are all the same to a Grand Touring rider who can carry his kit in removable hard shell side cases. Styled in a bright cognac coloration, the 2016 Grand Touring SE 1200 4-TEC provides ample power from a very smooth four-stroke triple that accepts standard 87 octane fuel, which will be readily available on any long distance cruise. Designed to carry two in style, this sled could easily serve as a well-appointed solo touring sled, giving you extra stowage for a singular getaway. The SE has the power, the comfort, and the features that allow you to truly enjoy a week-long snow tour. Ski-Doo definitely does touring right!